The Skinny: This science fiction flick from Wong Jing and Andrew Lau uses a self-important script to hide the fact that it really makes no sense and is inane and boring, to boot. Stars like Andy Lau, Shu Qi and Rosamund Kwan can't save this movie. Neither can plentiful special effects, which are actually quite awful. Maybe nothing can save this movie. After nearly two years in production, Andrew Lau and Wong Jing's Dr. Wesley movie finally hits the screens. For most Hollywood productions, two years of production time is normal, but for a Hong Kong flick it's rather unusual. Either it means they worked really hard on the post-production (i.e. The Storm Riders), or they simply were taking their time trying to find the film's voice (i.e. most Wong Kar-Wai movies). I'm not sure exactly what took so long with The Wesley's Mysterious File, but it doesn't seem to be either of the above reasons. Perhaps they simply didn't know what they were doing, and the result is a mishmash of poor plotting, atrocious acting and special effects that would look great on Sony Playstation, but are ill-fitting to the big screen. Yes, this movie is just not good. Andy Lau stars as pulp hero Dr. Wesley, who works for a United Nations extraterrestrial investigation unit located in San Francisco. 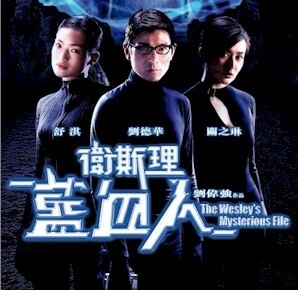 Wesley's adventure begins when he meets Fong (Rosamund Kwan), who's interested in purchasing a skeleton hand that supposedly belongs to an alien. Also, Wesley runs afoul of Sue (Shu Qi) and Pak (Roy Cheung), agents for Double-X, the US extraterrestrial agency. Double-X is searching the Blue Bloods, a race of aliens possessing nifty powers, and Wesley is enlisted to help. Fong is actually a Blue Blood too. Her race hails from the "Dark Blue," and are after the "Blue Blood Bible." She and her brother Tan (Samuel Pang) were separated when they arrived on Earth 600 years ago. She thinks he's dead, and wants to find the rest of his skeleton along with the hand she recently acquired. Wesley vows to help her, but he has his work cut out for him. The government actually has shady plans for the Blue Bloods, and there are even alien baddies (played by Mark Cheng and Almen Wong) who show up to cause mayhem. It'd be great if all of this combined to make a nifty science fiction flick, but this movie hardly qualifies. It seems that producer-director Wong Jing thinks sci-fi consists only of aliens, unintelligible scientific concepts and lots of people wearing black suits. This movie provides those things in spades, but it neglects to add everything else, like story, plot, direction or acting. Wesley fails on pretty much every level. The plot develops in bizarre, unseen ways that probably confused even the script supervisor. The actors can't give life to what isn't there, and seem to be acting in a vacuum. Also, the English acting by both Chinese and Caucasian actors is simply atrocious. That they're spouting pseudo-scientific crap makes everything even worse. Every scene features umpteen number of plot devices that only further the inanity. Nothing follows a logical course, and even the character motivations are non-existent. All this might be somewhat tolerable if director Andrew Lau managed to jazz things up with a humor or style. Sadly, neither happens. Lau seems content to let things run their inane, boring course until he can throw in a CG special effect to make things look prettier. Then producer Wong Jing appears onscreen in a smarmy cameo that serves absolutely no discernible purpose. Someone should let these guys know: this isn't filmmaking. Notes:  Since it's widely-derided release, The Wesley's Mysterious File has found a second life as a midnight laffer for those who dig "camp classics." The film played at the 2003 San Francisco Independent Film Festival, and the trailer had 'em howling. I've also heard strange urban legends of whole groups of people getting together to laugh their asses off at the trainwreck that is The Wesley's Mysterious File on DVD . One shudders to think of the horror.